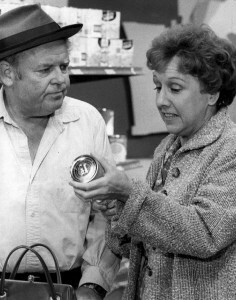 Half of the comic partnership that gave “All in the Family” its evergreen appeal was Jean Stapleton, who played Edith Bunker as a befuddled New York hausfrau, whose main concern was taking care of her husband, Archie. Louise Jefferson was a neighbor to the Bunkers. Later, the Jeffersons would “move on up to the East Side” when Mr. Jefferson’s Dry Cleaners expanded. For me, a white Protestant girl in the middle of the country, seeing the easy, loving rapport between the two women — black and white – was new. There were no African-Americans living within 20 miles of my home. My town actually had “blue laws” at one time that no African-American could sleep in the town. I did not like the show “Maude.” I found Bea Arthur’s character Maude too acerbic and unrelatable. However, Maude spoke for a generation of woman who were often denied a place at society’s table. In the most controversial episode of “Maude” – just weeks before the passage of Roe vs. Wade – the 40-something Maude finds out she is pregnant. Her adult daughter suggests an abortion. Published June 3, 2013 at The Broad Side. Please comment there.